Everyone is already moving on to autumn. The sweaters, pumpkins, chilly breeze it all sounds wonderful and honestly like a distant dream. At least around here mother nature has chosen to inform everyone the last few days that it ain’t fall yet! With temperatures soaring back into the 90s the last two days I’ve broken out my go-to summer beverage, sun tea. It’s like ice tea, well it’s a lot like ice tea but way more awesome. Stay with me guys. *optional* herbal tea or additional flavoring from fresh herbs, orange zest, mint sprigs, etc. I prefer to use quart size mason jars. Everyone can have their own jar to their taste and the jars have lids! Also somewhere along the homestead journey they started covering every. freakin. surface. in our home. Alright the fun stuff. Put fill your container with water (room temperature is fine), tea bags, and sugar and shake em’ up. Now find a nice sunny spot outside and set your jars there. Depending on how much sun your spot gets and how hot it is outside it can anywhere from 1-5 hours, just check it occasionally. Then strain out any added ingredients and enjoy your tea poured over ice. Some people say it has a different flavor than that brewed with hot water. We think it’s a little smoother. Maybe less tannins are released when you don’t use boiling water? If you know what exactly makes sun tea so tasty let me know. No matter why it tastes as good as it does it also feels good. It’s fun to make and I don’t have to turn on the stove! Could be a great activity for kids. Now just a note. There are potentially a few safety issues. Im really not trying to be dramatic just some words of wisdom that I thought I should pass along. One, while you can keep sun tea in the refrigerator remember that it will not stay good for quite as long as regular iced tea as it hasn’t been boiled. Not too bad right? Now the doozy, if you live in a dry, fire prone area be super careful putting jars out in the sun as it can intensify the sun and catch it on fire just like a magnifying glass. Well that’s what I’ve been told anyway. I’ve never actually lived in an area where it was an issue. Anyway if you can avoid drinking moldy tea and burning down your neighborhood I’m sure you love the tea. This post is linked to the Homestead Blog Hop and the Homesteader Hop. 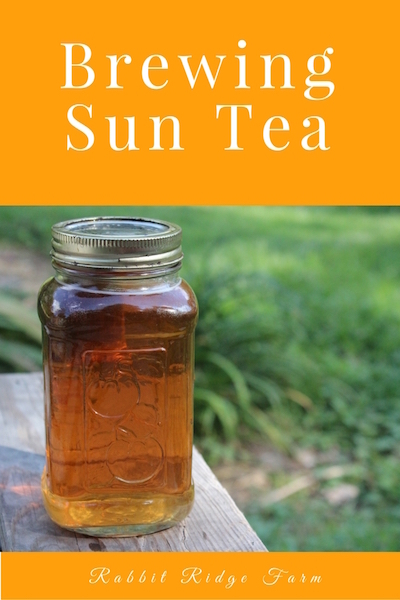 3 Responses to "Brewing Sun Tea"